When John F Kennedy's head exploded the world changed forever. One man shoots another - the wrinkle is that the victim was President of the United States. The awful simplicity of the murder seems to actively defy analysis, and so, like a snowball rolling down a hill random meaning began to accumulate around the event, connections drawn between strangers, odd coincidences given new significance, conspiracy haruspices divining motives from the splatter patterns of the President's brain matter. 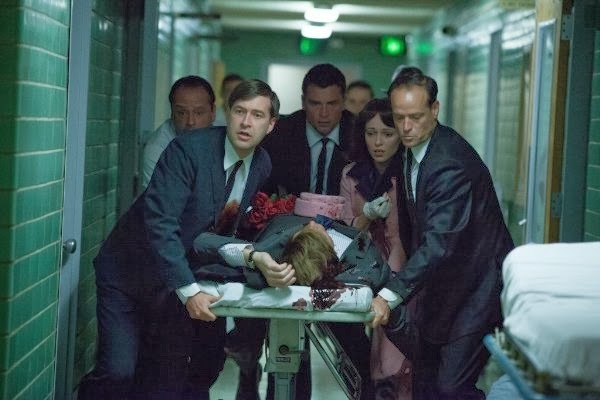 Parkland sets out to boil this chaos, presenting the Kennedy assassination and subsequent aftermath 'as it happened'. Landesman follows the people who have the misfortune to be caught up in it, chronicling their slow realisation that they're being woven into history and there's nothing they can do about it. They are: Abraham Zapruder (Paul Giamatti), whose amateur footage of the assassination became one of the most viewed pieces of film of all time; Dr Jim Carrico (Zac Efron) the doctor at Parkland Hospital who was first to treat the fatally wounded President; James Hosty (Ron Livingston) an FBI agent who was monitoring Lee Harvey Oswald yet never arrested him; Forrest Sorrels (Billy Bob Thornton) a Secret Service agent suffering guilty and shame for "losing his man"; and Robert Oswald (James Badge Dale) the brother of Lee Harvey Oswald trying his best to deal with the now notorious family name. To focus on the 'little' stories around a big event is laudable. Something as big as the Kennedy assassination is almost impossible to tackle head on, so by skirting the edges, Landesman explores the personal impact of being caught up in history. Importantly, we never meet Kennedy in the film, the President existing only as a grainy figure in the Zapruder footage, and an unresponsive bloody body. Jackie Kennedy and LBJ get similar treatment, relegated to the background, scurrying to and fro out of focus, trying futilely to process the cataclysmic shifts in their world. All of these bit players in history have compelling stories, and all are convincingly and sensitively portrayed. The highlight is Paul Giamatti as Zapruder. We never quite get to see the actual assassination footage he shoots; but in a neat bit of mirroring, we get to see Zapruder's face as he's filming. As the gunshots echo down he's first unreactive, then in a flash he realises what's happening. His eyes widen and he grips his camera tightly, tracking the car instinctively. Later on Giamatti manages to expertly blend shock, grief and guilt as he realises the financial worth of his footage. 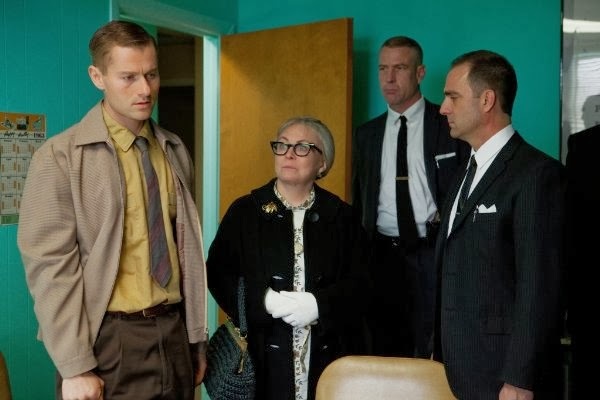 Similarly impressive is James Badge Dale as Robert Oswald. It's next to impossible for us to place themselves in Lee Harvey Oswald's shoes, yet we find ourselves identifying all too easily with the angry yet cool Robert. He's convincing as a man completely out of his depth, struggling for the slightest bit of dignity and trying very hard to love a brother who the entire world despises. Adding to his woes is his deluded mother, who doesn't show the slightest bit of contrition for her son's actions. She believes him to be a secret agent acting for the government and argues that he should be buried in Arlington Cemetery with the President he killed. Parkland is stuffed with these stories, examining so many individuals that we never really get to the heart of any of them. It's Zapruder and Robert Oswald that come closest to having fully-fledged character arcs, but some - including a promising turn from Billy Bob Thornton - just peter out. At 90 minutes Parkland is admirably concise, the short running time creating a faintly chaotic sense of pace, yet it just isn't enough time to do all these people justice. Where Landesman does succeed is capturing tiny, forgotten moments and objects. There's a fantastic sequence where the Secret Service aboard Air Force One realise that there is no space for a coffin in the passenger area, so have to hack apart the seats. Then they have to clumsily haul the President's coffin up the stairs to the plane, dreading that they're going to lose their grip and send his corpse tumbling out onto the tarmac. This attention to detail extends to minor objects that get swept into the drama; a crucifix from a nurse's locker; Kennedy's wristwatch; Zapruder's camera; a hitherto unopened letter from a nut. We see them acquire an immediate talismanic quality, random everyday objects (like the characters themselves) suddenly imbued with the importance of history. At times Parkland feels like it's frantically trying to get a perspective on chaos of the Kennedy assassination. It's decided that the truth must lie in the reactions and lives of those directly affected by it, using their stories as a way into the bigger picture. One some level this down to earth mentality is a nice opposing argument to Oliver Stone's rambling but brilliant JFK. Still, it falls into the same trap - searching for meaning where there might not be any. The centre of this film is an unknowable void, and by the final sequences Parkland all but throwing up its hands and admitting that it can't begin to work this out. "The greater part of any murder is the field of theory, fascination and hysteria that it engenders. A black diaspora. Our tireless, sinister enthusiasm. Truth is this has never been about the murder, not the killer nor his victim. It's about us, our minds and how they dance." Parkland lies squarely with this "black diaspora". It's a pretty good film, but at the centre is a hypocrisy (albeit an innocent one). The film has journalistic pretensions, seeks to show us 'what really happened'. Yet it can't and could never succeed. In trying Parkland merely throws up another smokescreen, another set of useless details, further blurring the very picture it's trying to restore to clarity. Parkland is on general release from November 22nd.